Mage Wars Academy is a fast-paced strategy card game of magical combat! In this expansion set, play as a telekinetic Forcemaster competing to prove that your mind is the most powerful weapon. Game play is quick and exciting, with tough tactical decisions and devious surprises every round! 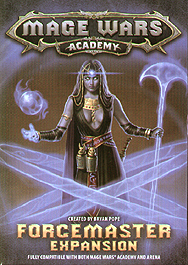 Players can customize their spellbook, with exciting spells from this and other Mage Wars products. Summon powerful constructs, bend your opponent's will, and cast secret enchantments to protect you and your allies in battle!